Lynn Norris from Hereford has written a song for the Community Choir at Alfrick. The Ballad of Molly and Ewan (A Three Choirs Romance) tells the story of Lynn's uncle and aunt's courtship during the Three Choirs Festival at Worcester. It's already a big favourite with our singers. We gave the first two performances of this new song at our concert (shared with the male vocal group GR-VIII) in Cotheridge Church on Saturday 29th July 2017, to an audience of over 100 people. Lynn's cousin David (son of Molly and Ewan) was in the audience with Lynn for these performances. 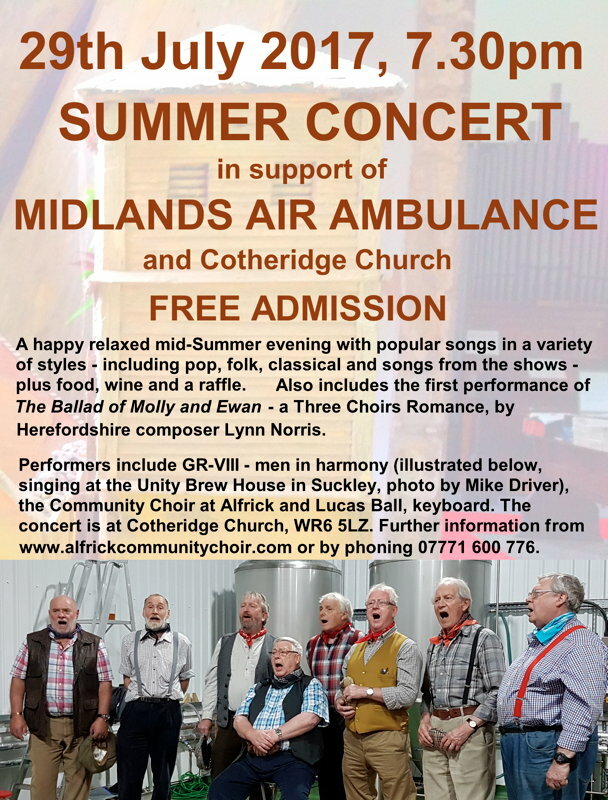 We have already given a third performance (in Bransford) , and hope to sing it again! Lynn has written ten musicals and many songs for children and adults. She has also written a book, Tales of the Century, relating people's accounts of their lives which involved surviving the wars and technological changes of the twentieth century. If your choir would like to sing Lynn's song, you can get in touch with her to request performing materials via Community Choir at Alfrick's contact page. Read more about Lynn and her new song here.